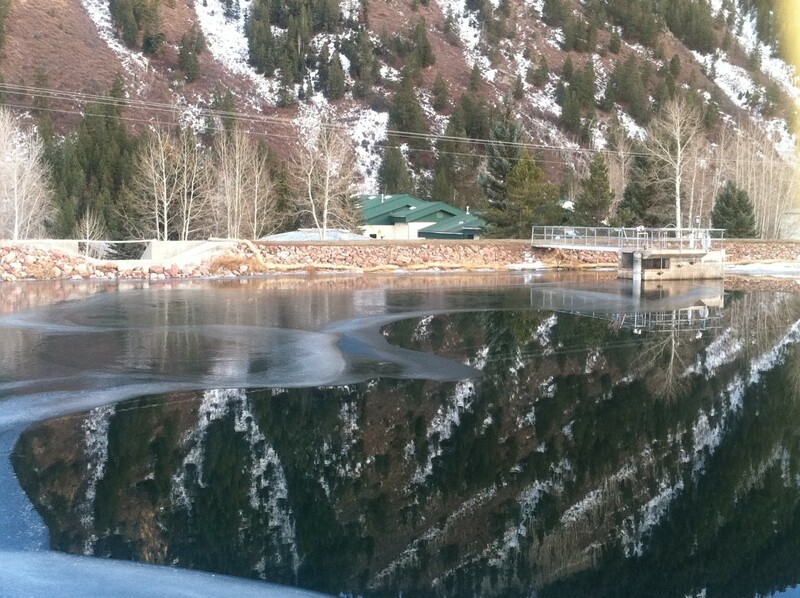 Thomas Reservoir, with the Aspen water treatment plant in the background. 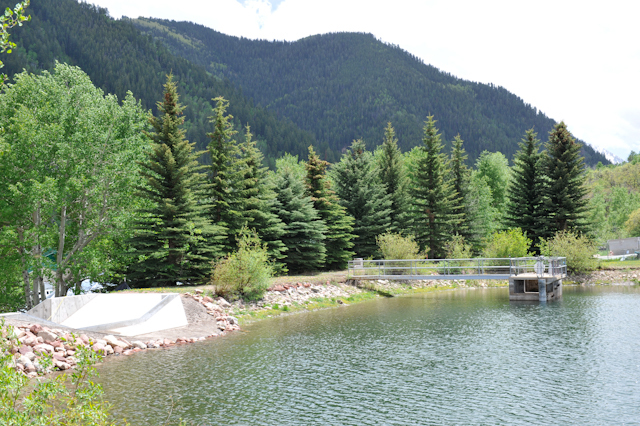 The project to cut down trees, dig out roots, and repack the earthern dam on the east side of the small Thomas Reservoir was completed on Nov. 19, according to Dave Hornbacher, director of utilities and environmental initiatives for the city of Aspen. The 16 Englemann spruce trees had been growing on the dam for years, but after a state inspection in April the trees, 30 feet to 40 feet tall, had to go. 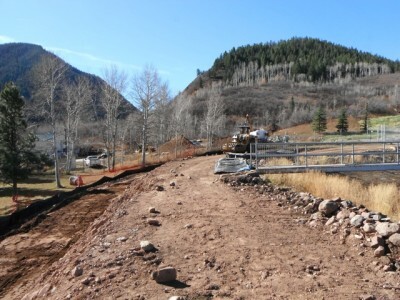 Nine aspen trees growing on the dam also had to be cut down and their roots dug out. Trees on a dam are considered a hazard as their roots can cause the dam to leak and high winds could blow the trees over, leaving a big hole where the roots were. The inspection — the first since 1989 — came in the wake of the city rebuilding the north wall of the dam to install a pipeline designed to serve as both a penstock for the city’s proposed hydro plant and an emergency drain line for the 10-acre-foot reservoir, which covers about an acre of land. When the city rebuilt the north wall, it raised the height of the dam to 19 feet, which brought the dam under the state of Colorado’s jurisdiction. A subsequent inspection brought the directive to cut down the trees and repack the dam. “The associated root systems penetrate into the [old east] dam,” John Blair, a dam safety engineer with the Colorado Division of Water Resources, found in his inspection report. “When the vegetation dies, the decaying roots can provide paths for seepage that could lead to a possible piping failure of the dam. “Also, if the trees were to fall over from high winds or other external means, the associated uprooted root balls would leave large holes in the dam effectively reducing the dam’s cross section and shortening potential seepage paths, which could also lead to a piping failure of the dam,” Blair wrote. The reservoir is a key part of the city’s municipal water system. It holds water from both Castle and Maroon creeks brought there by separate pipelines. The state has been kept appraised of the tree removal work and is now slated to conduct routine inspections of the dam and reservoir twice a year, according to Hornbacher. The east side of the dam holding back Thomas Reservoir, sans trees, on Nov. 26, 2012. The tall trees that once grew on top of the dam, and their roots that grew in the dam itself, have been removed. In all, the project cost $152,000 and was done in two phases. The first phase, the cutting of the trees down to 2-foot stumps, was done in August and cost $5,800. The second phase, digging out the roots and repacking the dam, was done between the first week of October and Nov. 19. It cost $146,000. The money for the project will come out of a maintenance budget at the water department and will not be paid for out of the hydro project budget. “In preparing for the Castle Creek Energy Center project,” Hornbacher said, “there was a lot of other additional work that was done that looked at all the different system components as well as inspections that occurred. 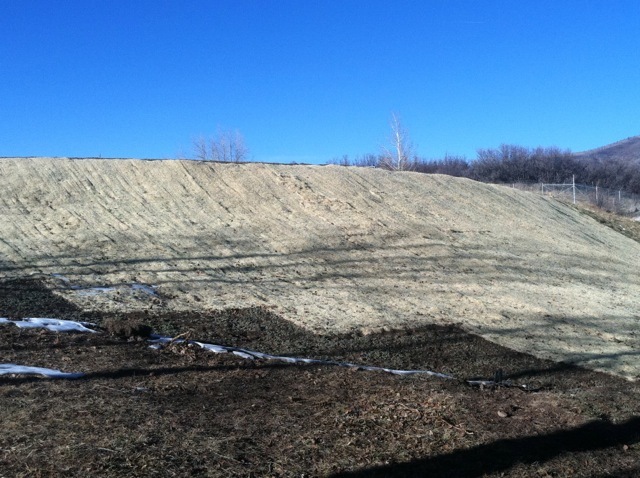 The east side of the dam at Thomas Reservoir just after the tree stumps had been removed in October. 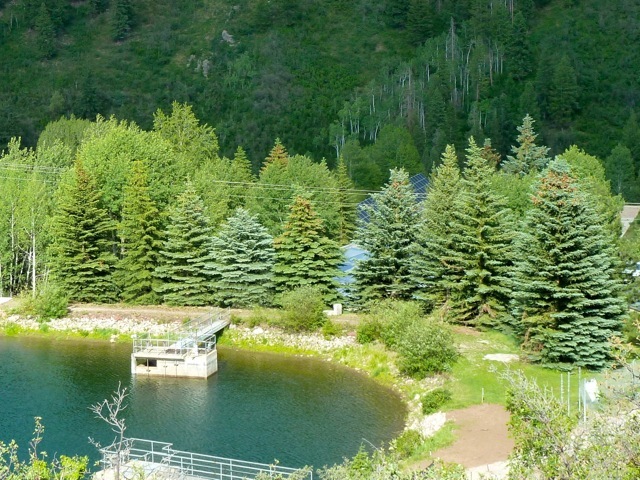 Other pending work at the reservoir and its related components includes installing an outfall, or tailrace, at the end of the penstock/emergency drain line. 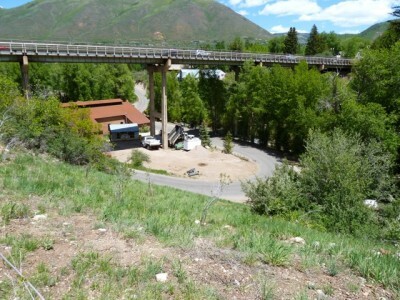 Today, the drain line stops just under Power Plant Road and does not reach Castle Creek. But this spring, Hornbacher said the end of the drain line will be completed with an “energy dissipating device” and an outfall/tailrace. The energy dissipating device would essentially take the place of the hydro plant in the emergency drain line system. Rough estimates were that the energy dissipation equipment would cost about $50,000, Hornbacher said, while the rest of the outfall/tailrace has long been estimated to cost $750,000. If the hydro plant were to be built, the energy dissipation equipment installed this spring solely as part of the emergency drain line would have to be taken out, but the rest of the outfall/tailrace could be used as part of a new hydro plant. “If the hydro plant were built, yes, that would have to be removed,” Hornbacher said of the energy dissipation equipment. Hornbacher also said the outfall/tailrace would be available for use during an emergency and would also likely be used to routinely drain water that overflows as part of the production of municipal drinking water. The existing overflow system on the east side of the water plant would also be used, Hornbacher said, but he wasn’t sure yet to what degree both drainage systems would be used. “It will be available for emergencies and there will probably be some routine use of it because there is a certain amount of water that consistently moves through the plant as part of reservoir balancing, so some of it may go done that pathway, or it may go down the existing pathway,” Hornbacher said. The City Council needs to approve a construction contract for the outfall/tailrace. Hornbacher said the outfall/tailrace, as well as other aspects of the city’s hydro project, will be discussed more fully in January with City Council. “With the recent election, and the forthcoming time with City Council in January, I think a lot of things will become a little bit more clear on direction and the things that staff are pursuing,” Hornbacher said.